A PDF version of this article appears in the March 25, 2016 issue of Executive Intelligence Review and is re-published here with permission. The following statement was delivered on the LaRouche PAC International Webcast of March 18, 2016. We have to look at the space program as a true expression of real economic value. It’s much more than a matter of practical economic applications. 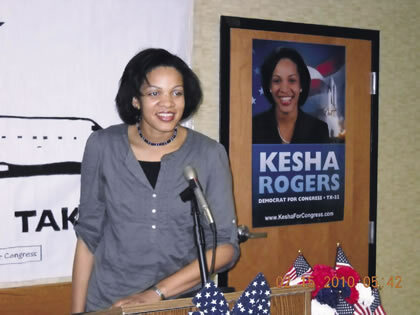 Kesha Rogers is pictured here as a candidate for Congress in 2010, at the Lincoln Dinner in Houston. I would like to start by continuing to develop what has been and must be the focal point by which we come to understand the necessity for the revival and the defense, not just of the U.S. space program, which I have continued to be a leader in championing, but of the necessity and development of what our space program truly represents for the progress of all mankind. As I stated in a recent EIR editorial, to understand the space program, one must go beyond the standpoint of looking at the economic conditions of the United States, or some practical applications to economics where the space program will provide benefits. We also have to look at the space program from the standpoint that it represents the true conception of real economic value. This is what is actually missing from our thinking. What has been attacked by the current Wall Street/British imperial system is that economic value is based, from their standpoint, on monetary value, and not on the creative powers and progress of the human mind. The real question at hand right now is to bring about a new conception of what is the identity and what is the purpose of mankind. I have continued to use the example and the works of the great pioneer of space flight, Krafft Ehricke. It is his conception of mankind as a space-faring creature with an “extra-terrestrial imperative” that must be identified and understood. Take the example of what China is doing now. It is completely rejecting the monetarist policy. The space program is not based on considerations of how much money you’re going to put into pet projects and specific projects. It is creating something that has never been created before, to actually create a new conception and a new identity for mankind, from the standpoint of the idea of acting on the future. That is what is being developed, for instance, by China in its investigation of the far side of the Moon. People may look at this and say, “Well how is this going to benefit us? How is this going to improve economic conditions, in terms of monetary value, for any of us?” That is the wrong way to look at it. You have seen two opposing conceptions of mankind. One is coming from the trans-Atlantic system, coming from a collapsing imperial system that has been based on money and monetary value, a system that is dying, and the other is represented by what Russia and China are doing. What I have developed in my recent writing is that the latter approach was also the thinking of the great leaders of our nation, represented by the ideas of Alexander Hamilton, Abraham Lincoln, Franklin Roosevelt, and John F. Kennedy. They were not focused just on creating new projects, per se, but on a new and different conception of the identity of mankind. Take the example of what we in the United States accomplished in landing a man on the Moon—the idea that Kennedy put forward, that by the end of the decade of the 1960s we would land a man on the Moon and return him safely to Earth. What was the vision and intention behind that? Was it just the idea that we would go and plant our flag on the Moon—for some short-term gratification? Or was it a forward-thinking outlook, in terms of the direction of mankind, recognizing what space pioneer Ehricke understood—that mankind is not just a creature of planet Earth. We are not just a part of, as he called it, a “closed system.” So it is our responsibility to go out do what no other animal is capable of doing, of actually conquering and developing—coming to understand the purpose of mankind and accomplishing the development of mankind in the Universe as a creature of our Solar System and our Galaxy. Ehricke was very insightful in writing about the Renaissance, the Italian Renaissance, as an achievement of human progress. He argued that that Classical Renaissance contributed to the development of what centuries later became our space program, and provided the intention that guided the direction of space travel and the space program. Look at this from the standpoint of Ehricke’s understanding that the Renaissance was guided by the scientific breakthroughs of a Brunelleschi or the breakthroughs that came about from the works of Kepler—that the idea of mankind is to create something fundamentally new, something that has never been created before and, in so doing, to increase the relationship of mankind to the Universe. 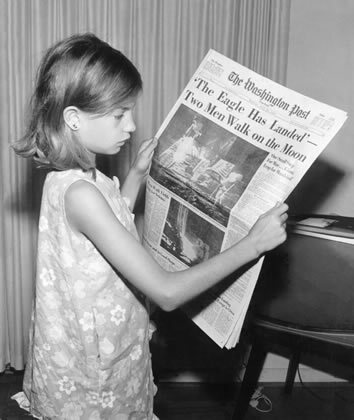 Moon landing, 1969: “One small step for a man, one giant leap for mankind.” We must create a new identity for mankind from the standpoint that we act on the future. Now that’s economic value! That is precisely what is not being discussed in the debates back and forth from the standpoint of members of Congress addressing the space community on which budgets should be cut and which should not. As I stated before, we have to have, in defense of the space program, a new conception of the direction of mankind. That means we are removing all limitations on progress, all limitations imposed on mankind’s ability to continue to understand how to make new discoveries of the scientific principles of what’s out there. Why should we actually investigate the Solar System? What is our mission in doing so? It is not about a money-making, short-term gratification. So I think this emphasis that Ehricke put on the Renaissance as an ideal, of looking at why we have, as a human species, an extraterrestrial imperative, is really continued in what you’re seeing coming from China, not just in its space program, but in the development of the win-win strategy of cooperation for all mankind—for all nations to come together to address the necessary challenges of the economic condition of the planet by actually recognizing that the solutions do not lie right here on planet Earth. That is the conception I want to get across. I hope to have further discussion, as we continue this fight, to identify what is the real mission of the space program, and how we might rid the world immediately of this current dead system that is keeping us from advancing in the way that we should. Video: Schiller Institute Conference, Houston, TX, Feb. 27, 2016: There are NO Limits to Growth: Mankind Must Conquer Space! Kesha Rogers: Mobilize the American People To Restore a Vision of the Future! From Kepler To China: What Is Mankind, Such That We Would Want To Save It?